There was a paper that came out last week that you might have heard about. It was by David Ridley from MIT and a team of others, including some very high profile scientists. What they did was investigate the impact of volcanoes over the past few years. They found that the cooling effect of volcanoes since 2000 could be from 0.05°C up to as much as 0.12 °C, which would be quite a bit more than previously thought. The Sarychev Peak Volcano, on Matua Island, erupted on June 12, 2009. There have been other recent studies looking at the impact of volcanoes, including by some of the co-authors of this paper. I've written previously about the article by Gavin Schmidt, Drew Shindell and Kostas Tsigaridis, in a special edition of Nature Geoscience, "Focus on recent slowdown in global warming". That issue also had an article on volcanoes, two of whose co-authors were also co-authors on the Ridley paper. This new work was different. What this team did was look particularly at the impact of volcanic aerosols in the stratosphere below 15 km. From satellite observations, scientists know that above 15 km, volcanic eruptions that are smallish in size can perturb incoming solar radiation. 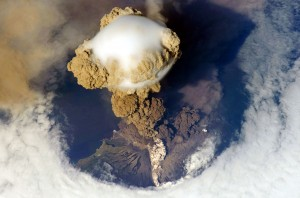 David Ridley found that below 15 km in the stratosphere, there has also been a measurable impact by volcanoes. Based on observations from lidar retrievals, balloon-borne aerosol sondes, ground-based AERONET sun photometers, and satellite data, we estimate increases in global total SAOD since 2000, together with associated uncertainties. 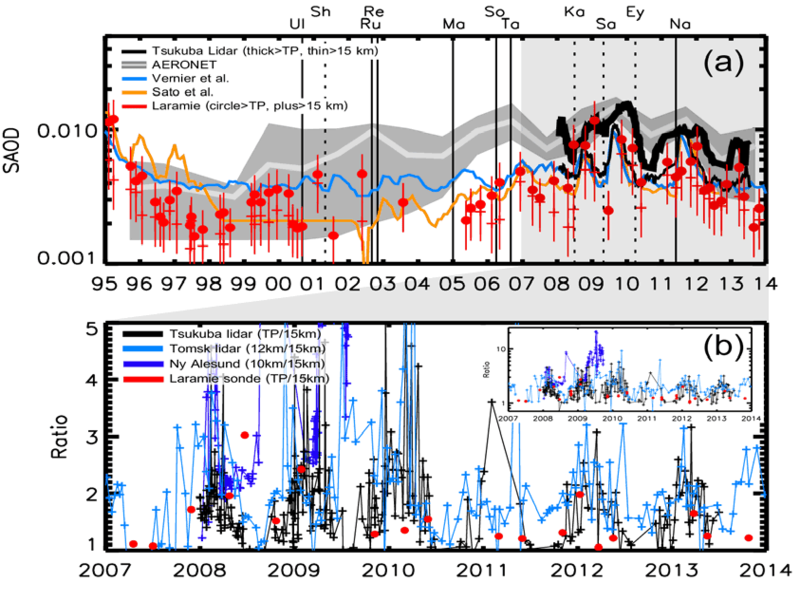 The resulting total estimated volcanic aerosol forcing averaged over the period 2000-2013 is found to be -0.19 ± 0.09 Wm-2, up to 80% larger than the estimate of Solomon et al. .
...To ensure that AERONET measurements can provide a reliable estimate of volcanic SAOD, we demonstrate that the timing of the increase in SAOD is significantly correlated with volcanic eruptions, and that the ability to detect volcanic signatures is not significantly affected by station location and sampling periods. We also compare AERONET data to lidar observations. What the team calculated is that global aerosol forcing from volcanoes since 2000, was -0.19 ± 0.09 Wm-2, which is between 0.05 to 0.12 °C of cooling. There are some very good articles on the work. There's one by Sid Perkins, writing for Science magazine, with another very good article by Leon Clifford on Reporting Climate Science and a press release from AGU. The paper also made news at CBS and Australia's ABC (h/t Billy t Mt). You might also be interested in this paper by Ryan Neely and co from last year, which suggested something similar. There's an article about it here. BTW - many thanks to all who gave me a copy of the Ridley paper - David Ridley, Kate Wheeling and Martin L and RP/TB. What excuse number are we up to now? Anyone keeping track? Greg Goodman indulges in some unconventional thinking and says, no, because he said so, when Wondering Willis' went nuts about volcanoes - volcanoes cause warming, don'cha know! I already commented on this today in Willis’ thread. As soon as I saw the word “robust” I stopped reading. This is the sentence he saw that foul word in: To build the best climate models, he said, a more robust monitoring system for stratospheric aerosols will need to be developed. To get to it, he had to read the entire press release. All he missed out on was the abstract. Karl Compton goes for the "it can't be us" option. Well, Karl, it isn't "us" this time. We didn't cause the volcanoes to erupt, believe it or not. Kinda reminds me of the Ozone Hole. It was there when we first had the tools to see it, so it must be our fault, or some kind of flawed logic like that. Blame America first. Then the West. Then technology. Then humanity in general. mpainter decides that the scientists shouldn't have used actual observations in their calculation. johnmarshall writes something about able gulls. Not sure that birds have much to do with global cooling. Another government paper written to sway the gullable. Government papers are good at cherry picking but little else. See my reply to a comment above. Catherine Ronconi is a newcomer I think. She wants to work out global average surface temperature in a test tube, figuring there would not be any "enhanced greenhouse effect" in a laboratory. It’s more insidious than a fantasy. It’s adjusted, interpolated, folded, bent, spindled & mutilated. Granted that if anything GISS is even smellier garbage, but just. Is it better than BEST? Possibly. If they’re all the best that “climate science” has to offer, then IMO better not to use any global reconstruction at all. Compare to best stations for regions, such as (admittedly adjusted, too) CET or the US or well maintained oceanic island stations, without trying to create a global average sure to be execrable at best and more likely worse than worthless, except, as I say and others have said, to demonstrate how miserably the CO2-based models fail. IMO a truly valid GASTA, if such a creature be possible, should and would show at most the ECS found in the lab, although feedbacks are probably net negative, so no enhanced GHG effect would be at least as likely. There are lots more comments that I haven't bothered reading. If you want to, you can read the rest of the protests here. Here it is in picture form for those less able to read. If they re-did their paper today, the slope would be a bit greater. Hey, what do you expect deniers like us know? We're not VULCANnologists. We do not believe Dr. Spock is real. Spock was obviously a libtard.